The first Dark Horse comic I remember reading was Star Wars: Dark Empire #2. I hadn’t thought much about Star Wars since the mid-to-late ’80s. The movies were over, the Marvel comic had been canceled and I was not yet aware of Star Wars: Heir to the Empire. This was a time before Dante and Randal debated about the fates of independent contractors on the second Death Star. This was early 1992, and just two years prior, Star Wars was a dead property. Producing this comic was a gamble on Dark Horse’s part. Today, Dark Horse released a comic simply titled Star Wars, which takes place a mere month after the original movie. Writer Brian Wood and artist Carlos D’Anda hit all the right beats, showing readers just where the characters we know and love are shortly after the destruction of the Death Star. Luke and Leia are both idealists, struggling with the immense cost of the Rebellion’s victory at Yavin Four. Han Solo is as much a scoundrel as he was when he bargained with Ben Kenobi. Chewbacca is Han’s conscience. And Darth Vader is Darth Vader. The issue begins with Luke, Leia and omnipresent X-Wing pilot Wedge Antilles searching for a new home for the Rebel base. Upon finding a system, they are immediately ambushed by a Star Destroyer and a crack squad of Tie Fighters. 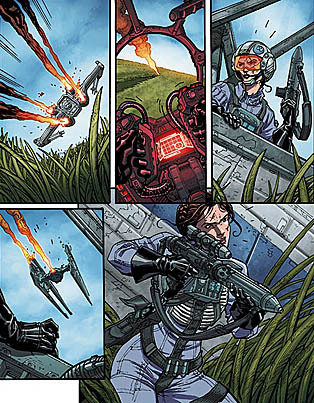 Wood and D’Anda use this scene to show readers a Leia Organa who is an excellent X-Wing pilot and a damn good fighter on the ground. Leia doesn’t need to be saved in this issue. The strength of this book is that Wood and D’Anda have a strong handle on the characters. Han Solo is still cocky and obsessed with money. He’s working with the Rebellion, but only because he thinks it will save his hide from Jabba the Hutt. Luke is still taking those steps into a larger world. Leia seems to carry the weight of victory – already starting her transformation from princess in distress to Rebel leader. 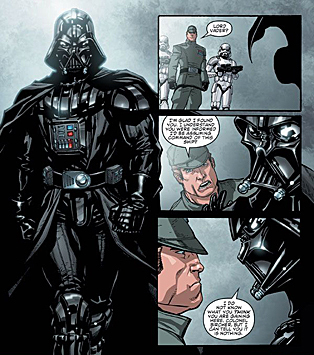 Vader is imposing when set next to Imperial officers, but defeated and sullen when talking with the Emperor. One issue in and this book feels like a sequel to Star Wars and a bridge to The Empire Strikes Back. In Darth Vader’s first scene, the Emperor strips Vader of his command and challenges the Dark Lord of the Sith to redeem himself in the Emperor’s eyes. Vader’s in an interesting emotional place. He is shamed by his defeat and angry at the loss of his rank in the Empire. But there’s something else weighing on the former Jedi Knight’s mind. Vader is haunted by something he heard at Yavin Four, specifically, a name: Skywalker. 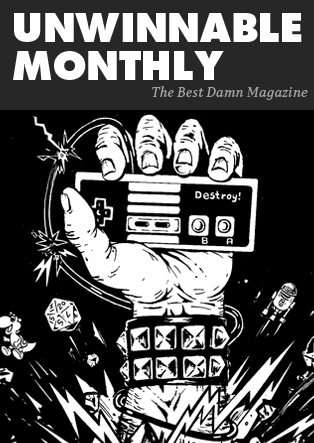 There’s only one moment in this issue that doesn’t ring true. There’s a scene where the Emperor is berating Vader, blaming the Dark Lord for the loss of millions of credits. It’s only one line of dialogue, but for some reason, it took me right out of the story. Whenever Han Solo talks about money, it makes sense, but Emperor Palpatine talking about money feels out of character. Still, that’s a small caveat, as the book does so much more right. What’s special about this book is that it’s one of the few Dark Horse series to follow the original characters so soon after their first adventure together. The last time Dark Horse explored this era was in Star Wars: Rebellion, which ended in 2008. It’s 2013 now, and Star Wars has been omnipresent for almost 22 years (Bantam Spectra published Heir to the Empire in May of 1991). There is a plethora of toys, novels and videogames. Lucasfilm produced three movies and two critically acclaimed cartoons. And then there’s Dark Horse Comics – the keeper of the flame. Publishing Star Wars comics since December of 1991, Dark Horse has made a good practice of exploring so many different corners of the Star Wars Universe. There was the Tales of the Jedi comic in the ’90s and more recently, Knights of the Old Republic, both of which added so much depth to the Star Wars tapestry. The books told tales set thousands of years before Luke Skywalker’s birth. Then there was Star Wars: Legacy, which told stories hundreds of years after Luke’s tenure as the last hope for the galaxy far, far away. So, nearly two decades after they started publishing Star Wars comics, it is great to see Dark Horse bring their “A” game to the characters that have captured the imaginations of millions since 1977. Ian will probably get trolled by the Yoda bot when he promotes this link. See his reaction on Twitter @IanGonzales.